Daniel E. Goldberg is a 1983 graduate of the University of Wisconsin Law School. He was a member of the litigation department of the Milwaukee law firm of Previant, Goldberg, Uelmen, Gratz, Miller and Brueggeman from 1983 through 1997. In 1998 he opened the Law Offices of Daniel E. Goldberg where he continues to represent injured and disabled people in claims involving personal injury, workers compensation and Social Security Disability. He has held memberships with the Wisconsin Trial Lawyers Academy, Wisconsin Association of Worker’s Compensation Attorneys, and National Organization of Social Security Claimants Representatives. In over 30 years of practice he has helped thousands of individuals obtain injury settlements and disability benefits. 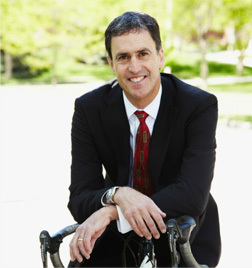 Mr. Goldberg is a strong supporter of the Wisconsin Bicycle Federation (BikeFed), and serves on its Board of Directors. He is a USCF Category 3 licensed cyclist. He began his racing career in 1968 as a member of the Milwaukee Wheelmen Cycling Team. After completing his cross country and track eligibility at the University of Wisconsin, he returned to cycling and was a co-founder of the TMJ4 and Healthpoint Cycling teams. He previously raced with the ISCorp Cycling Team and is currently a member of the Team Velocause, serving on its board as a director of the team’s highly regarded Volunteer Activities program. He is also an avid cross country skier, and is currently a 3rd wave skier at the American Birkebeiner ski race. Cyclist who was injured by a dog who broke free of its owner’s hold of its leash, allowing it to jump up and injure a rider. Cyclists who were injured while driving their vehicles, who were struck by other vehicles on the roadway. Cyclists whose bicycles and other equipment were damaged by vehicles, movers and airlines, or were stolen, such claims being covered by homeowners and/or motor vehicle insurance policies. Daniel E. Goldberg has represented clients from across the State of Wisconsin, including Milwaukee, Waukesha, Madison, Green Bay, Racine, Kenosha, Wausau, La Crosse, Eau Claire, Janesville, Beloit, Sheboyan, Fond du lac, Appleton, Oshkosh, Rhinelander, and across Northern Wisconsin.